USA - It was a spectacular affair to remember, with the nation’s number one college basketball team being serenading by coaches, screams of fans and hip-hop superstar Drake. The University of Kentucky’s basketball program looks to outdo itself year after year, not only on the basketball court, but also in its celebration and biggest recruiting weekend known as Big Blue Madness. Bandit Lites provided the lighting for the event which took place at Rupp Arena. 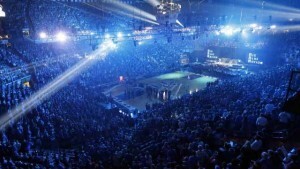 The ceremony and scrimmage were televised and watched by millions anxious to see what Kentucky would be bringing to the courts this year. "Bandit Lites has been providing Lighting for our Big Blue Madness Event every year since 2011 and they have done an outstanding job each year," said technical services manager, Bob Stoops. "Once Bandit has signed on for the event, I no longer have to worry about the lighting." Bandit installed lighting over the entire playing surface and stage areas, making sure the design was flexible enough not only for flashy team introductions, but throughout the event to enhance the fan experience. Aaron Swetland designed the rig and Carter Fulghum was at the helm of the console for the evening as lighting director, in addition to project manager Shawn Lear provided additional support. Lighting equipment included Mac 2000 profiles and washes, Coemar Infinity washes, Chauvet Legend 230SR Beams, Color Kinetics lwBlasts, GRN Par 64 and GRN washes, with two grandMA 1 consoles. "This is an event Bandit looks forward to each year, and one that we are appreciative and proud to be a part of," said Bandit’s Brent Barrett. "Working with Bob Stoops is such a pleasure; he is one of the true professionals in our business and has put together a world class production team for Big Blue Madness." "I am always impressed with how well the equipment is prepped for our event," added Stoops. "This event is a one-off and yet all the equipment is prepped as if it were a tour: Cable bundles are pre made and truss and lighting instruments are all marked, making the load in extremely fast and organized." Big Blue Madness is just another stellar example of the scope of events Bandit is honored to work on, and is a success year after year, a sentiment Stoops echoed saying, "I have found every one of Bandit’s personnel not only to be professional, but also friendly and quick with a smile. They also respond positively to the ever changing on site needs. I know that Bandit will do whatever it takes to make our event successful. 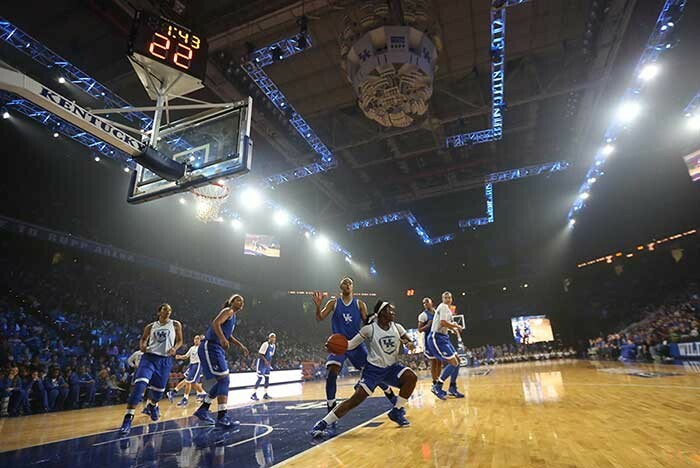 Bandit Lites is a great partner for us on Big Blue Madness!"